Chad: Was France's Military Intervention in Chad a Regression? 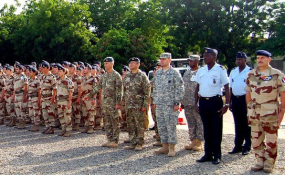 The militaries of France and Chad participate in ceremony to commemorate launch of Operation Barkhane. Plus ça change, plus c'est la même chose - the more things change, the more they stay the same. For decades French governments have insisted, hands on hearts, that the infamous policy of intervening militarily to prop up unsavoury and not very democratic African leaders is a thing of the past. Current President Emmanuel Macron has been particularly insistent that things have changed. And for years, there has been proof of greater collaboration with African countries through initiatives such as the G5-Sahel, rather than going it alone. Yet in the first week of February he ordered French fighter jets to attack a convoy of trucks carrying rebels in north-east Chad. The mission was to stop the rebels advancing on the capital N'Djamena to topple President Idris Dèby. This seemed out of step with France's Africa policy of reducing interference in internal politics without wider consultation. The attack immobilised 20 trucks, killed many rebels and enabled Chad's military to capture about 250 fighters of the Union of Resistance Forces rebel group. Why did France conduct this seemingly retrogressive move? It was an apparent contradiction of France's intention not to involve itself in internal African conflicts, unless that furthers the war against terrorism, in which the former colonial power is deeply involved. The last time France intervened militarily to prevent an African ally being toppled by an internal threat - not linked to terrorism per se - was also in Chad in 2008. France used its airforce to attack rebels advancing on the capital from their redoubts in Darfur. In 2011 French troops played an active role - with UN troops in support - in helping Alassane Ouattara defeat the recalcitrant Laurent Gbagbo in the civil war that erupted in Cote d'Ivoire. That was a rather different campaign since the war was sparked by Gbagbo refusing to accept his defeat in the December 2010 elections. And in 2013 France intervened militarily in Mali but this was distinct as its intervention clearly saved the country from being overrun by jihadist and separatist forces. So African countries were among those that applauded France's action. Despite the apparent contradictions in its policy manifested in Chad this month, Macron's government seemed unashamed. It said it had a defence agreement with Chad and that Dèby had asked it, in terms of that agreement, to rescue him from imminent toppling. There is little evidence that a real coup was in the making, since the rebels were still far in the north of Chad, close to the Libyan border which they have been using as a base. Commentators suggest that the rebels were pushed out of Libya where the powerful general Khalifa Haftar has been advancing on the south of the country. Gilles Yabi, founder of the WATHI think tank, notes that France has been present militarily in Chad for decades and played a role in bringing Dèby to power after Hissène Habré, 'and not a lot has changed since then'. 'Chad remains important strategically for France to monitor the Sahel and Sahara regions and the militarised regime of Dèby has been helpful for French interventions in Mali and other places: Chad can lose dozens of soldiers in battlefields without political consequences for Dèby - and that is important to supplement French military interventions,' he notes. Parliamentarians grilled foreign minister Jean-Yves Le Drian, noting that the intervention wasn't in the mandate of France's Operation Barkhane, with 4 000 troops stationed in Chad. The operation is explicitly designed to fight terrorism in the Sahel and the Lake Chad basin. An analyst who requested anonymity said that France had defence agreements with many African countries that provide a legal basis for military intervention. But what made these airstrikes unique was that France used Operation Barkhane's equipment and personnel to service a local demand pertaining to a bilateral agreement with Chad. Institute for Security Studies researcher Mohamed Diatta adds that in the same year it intervened in Mali, France refused to apply its defence agreement with the Central African Republic to prevent the toppling of former president François Bozizé. Chad would have had a say in this, which suggests that France selectively uses and applies its defence agreements. French analysts have also been critical. Immediately after the attack, when it was still unclear who the targets were, Roland Marchal, a leading expert on Chad from the Sciences Po University in Paris, slammed Macron's government for acting outside of Operation Barkhane's mandate. Curiously the French intervention in Chad didn't evoke much reaction at the recent African Union summit in Addis Ababa, which took place a few days after the French assault. The explanation could be that Dèby, who was at the summit, and AU Commission chairperson Moussa Faki Mahamat, a former foreign minister of Chad, are both powerful and influential players in the AU. Some have tried to justify the attack by suggesting that in an indirect way it was part of France's contribution to the fight against terrorism. This is because Dèby is a vital ally in that fight, and so toppling him would have weakened the campaign. But that argument assumes that Dèby's hold on power was really threatened by the rebels, which is unclear. Also, that sort of Cold War-era argument is a little too tortuous and self-justifying. However you look at it, this seems like a regression to a previous, unhappy era of Françafrique - France's policy of open meddling in Africa.